Josh Wheeler is a first-time Paralympian winning a silver medal in wheelchair rugby at the 2016 Rio Paralympic Games. 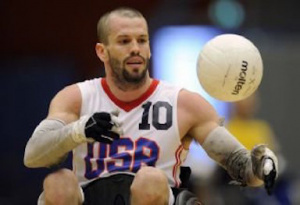 He played with the US Paralympic wheelchair rugby team in 2012 when they competed at the London Paralympic Games. He won first in the 2013 World Wheelchair Rugby Challenge and third in the 2014 World Championships. Wheeler was struck by a car in 2006 while on his motorcycle. The accident left him with a broken neck and he lost function of his lower body and part of his right arm and hand. He was born on April 14, 1980, in Sacramento, California. He attended Brigham Young University. He served a full-time mission for The Church of Jesus Christ of Latter-day Saints. This page was last edited on 29 December 2016, at 15:01.